On Saturday, 22 November 2014, International Holodomor Memorial Day, at 19:32 local time, the UWC calls upon every family around the world to say a prayer for the victims of the Holodomor and light a candle of remembrance in the window of their home. The recent Milan Summit with Ukraine, Russia and the European Union underscores once again why simple diplomacy may not be the solution to the current Ukraine-Russia crisis. That was strikingly evident from remarks made by Russian President Putin questioning arrogantly the sovereignty of Ukraine so that even Germany’s Chancellor Angela Merkel felt compelled to reprimand the Russian President reminding him of the Budapest Agreement of 1994. She could have mentioned many more agreements and treaties to which Russia or its predecessor the USSR was a signatory. A signature on a legally binding document means nothing to Putin or Russia. 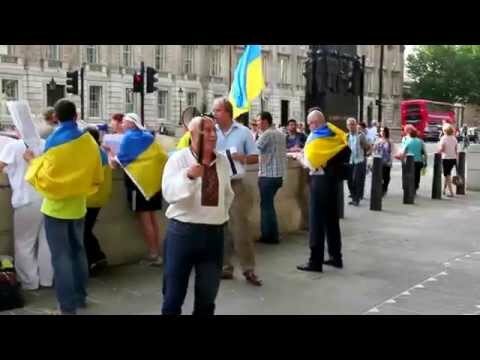 Passers by and members of the public were reminded that the murderous Russian terrorists financed and supported by President Putin were responsible for the MH17 tragedy and that it was his missile that was shot down an innocent civilian plane. 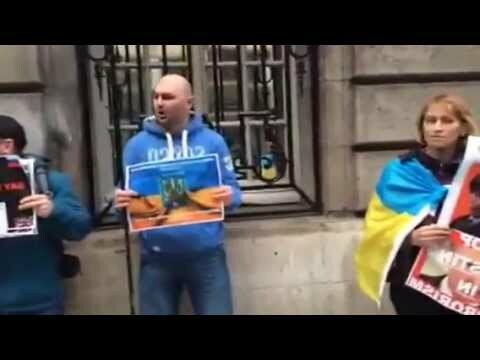 On Wednesday, Ukrainians living in London demonstrated outside the Royal Automobile Club on Pall Mall, demanding the RBCC stops doing business with Putin’s criminal regime and demand the introduction of “Iran style” sanctions against Russia.